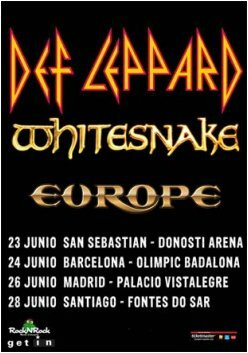 The Def Leppard, Whitesnake and Europe show in La Coruna, Spain on 28th June has been changed to a new venue. The show has been downgraded from an 11,000 capacity show to 6,050 at the Pabellón Multiusos Fontes do Sar. This venue is located within La Coruna province in Santiago de Compostela. Tickets for all four shows are already on sale at Ticketmaster Spain. "The La Coruna Show on the 28th in Spain HAS BEEN CHANGED. It is now at Santiago De Compostela in Fontes Do Sar. Tickets are the same, this is a much better venue."